Police in Dyfed-Powys have joined forces with health professionals to deliver a mobile triage service for rural areas for people in mental distress and offers them more suitable care. The force, which polices the biggest area in England and Wales, found cells were too often being used as places of safety for vulnerable individuals, after they had been involved in incidents. 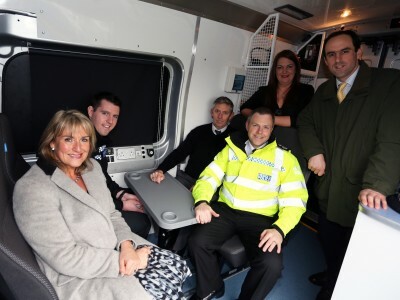 Police in Dyfed-Powys have joined forces with health professionals to deliver a triage service which cuts the use of police cells for people in mental distress and offers them more suitable care. However, the facilities were not appropriate for people waiting for mental health assessments and the use of officers to transport people across large rural distances was draining resources too. Mental health detentions in the region were costing the taxpayer around £313,000 every year in policing costs, it is estimated. The Police and Crime Commissioner for Dyfed-Powys, Christopher Salmon, discussed the issue with police and health professionals from Hwel Dda University and together they formulated a plan for mobile units offering a triage service. A £90,000 grant was secured through the Home Office Innovation Fund, which helped to pay for two bespoke vans equipped as mobile health consulting rooms. A police constable and health practitioner lead the service, known as the Mobile Assessment and Support Team (MAST) unit. Another 10 trained officers and a group of health practitioners support them in the delivery of the scheme. The team is able to access police and health records so they can provide background information to officers, who in turn can offer people tailored help on the ground. This enables better decision-making at the scene of incidents. Most of the information is provided remotely, via police radio or telephone, but in other cases the van is deployed. The service launched in January 2015 for a 12-month pilot and in the first two months the van helped 55 individuals directly – including signposting to other services – and assisted police officers in making informed decisions in 58 other instances. Early indications are that fewer people suffering mental trauma are now being arrested. It is estimated that 25 detentions under Section 136 of the Mental Health Act have been averted as a result of the service being in place. “Results include better care for the vulnerable and better decision-making by the police, more timely assessments of mental health needs and more positive experience of police contact,” says Andy Pearson, public affairs adviser for the Office of the Crime Commissioner. A student at the University of South Wales will monitor the service continuously throughout the rest of its 12-month pilot, with a view to producing quarterly performance reports. These will assess the service from both a qualitative and quantative point of view. The Police and Crime Commissioner is also urging the Welsh Government to commit to a new mental health crisis initiative, similar to England’s Crisis Care Concordat, which aims to improve emergency support. The concordat is an agreement is between police, mental health trusts and paramedics and describes how people experiencing a mental health crisis should get as good a response from the emergency services as someone in need of care for a physical condition. “The agreement will help those with mental health conditions get the care they need when they are involved in incidents – and will ensure police officers can focus on fighting crime,” says Mr Salmon. Key partners in the initiative include Dyfed-Powys Police, Hywel Dda University Health Board, Carmarthenshire, Pembrokeshire and Ceredigion County Councils, West Wales Action for Mental Health, University of South Wales and the Welsh Ambulance Service. Dyfed-Powys, the biggest police area in England and Wales, faces a challenge with its geography & infrastructure. With population and services being thinly spread, police cells were being used too often as places of safety for people in need of mental health assessments. Evidence showed that having a mental health triage service could significantly reduce the number of Section 136 detentions. Cells are often not appropriate for those vulnerable individuals involved. The use of police to transport them to cells across large rural distances – and detain them – is resource-sapping for the force. Dyfed-Powys mental health detentions cost the taxpayer around £313,000 every year in policing. PCC is urging Welsh Government to commit to a new mental health crisis care initiative similar to England’s Crisis Care Concordat which aims to improve emergency support for those in mental health crisis. The English Concordat is an agreement between police, mental health trusts and paramedics which describes how people experiencing a mental health crisis get as good a response from an emergency service as people in need of urgent care for physical health conditions. Commissioner discussed rural need with police & health professionals. Two bespoke vans bought and equipped as a mobile health consulting rooms. Service launched January 2015 for 12-month pilot – led by a PC and a mental health practitioner supported by 10 trained officers and health practitioners. They access police and health records and provide background information to officers so they can provide specific assistance to people who need tailored help. Most information and advice is provided to officers remotely, via phone or police radio. In other cases the van is deployed. Key partners include: Dyfed Powys Police, Hywel Dda University Health Board, Carmarthenshire, Pembrokeshire and Ceredigion county councils, West Wales Action for Mental Health, University of South Wales, Welsh Ambulance Service. Improved communication and shared resources by police and health board. Early evidence of fewer sick people being arrested. 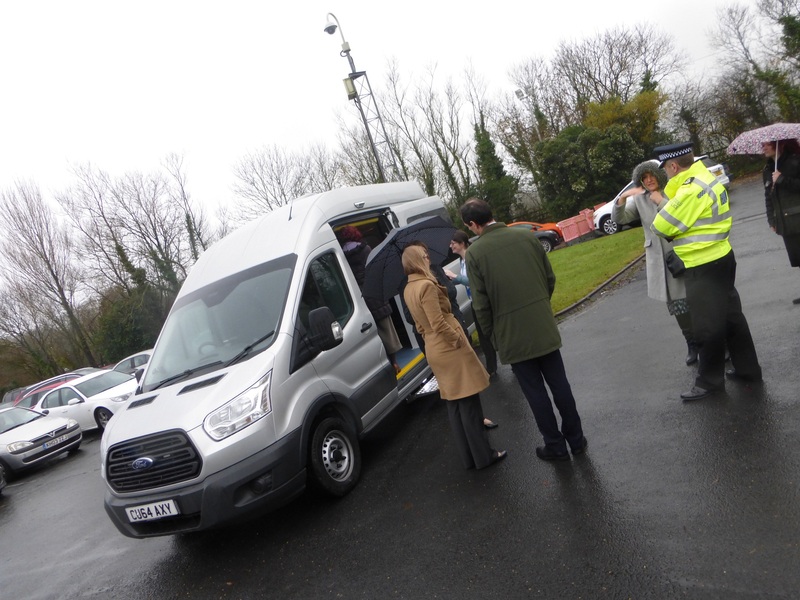 In the service’s first two months (Jan-Feb 2015) the van helped 55 individuals directly – including signposting to services – and assisted police officers make informed decisions in 58 other instances. Estimated 25 Section 136 detentions have been averted. Results include better care for the vulnerable and better decision-making by police, more timely assessments of a mental health needs and more positive experience of police contact. It is hoped service will decrease applicable detention figures by 80% and that a £249,200 police saving will be made in 2014-15. Service will be assessed continuously throughout the 12-month pilot, by a University of South Wales student who will work with the project team and undertake quantitative and qualitative evaluation with service users – including those in rural areas – and produce quarterly performance reports. People who have suffered mental trauma after being involved in police incidents will be looked after in mobile units instead of cells in the Dyfed-Powys area in future.